Oh boy oh boy oh boy! I must have been very nice to have deserved Melanie from Cyinical Optimism for my Secret Santa from the 2009 Holiday Swap. I couldn't believe my eyes as I unpacked my box. 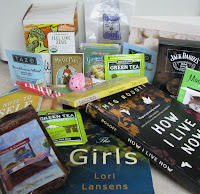 First, I know Melanie's been on my blog on a Thursday because I got all sorts of fabulous teas and even a packet of hot cocoa. And I know she paid attention to the "favorite flavors" part of the entry form because I got lemon, ginger, and dark chocolate goodies (and some whiskey pralines!). When I'm done snacking and it's time to get reading, I have some heavenly spicy scented handmade goat's milk soap for washing up. Next, I can pull out my new pen and cool notepad, get my bookmark ready and decide between two (yes, two!) books to read. I also got a super Nashville magnet and some yummy lip gloss. I am so thrilled -- I could get used to being treated so well! Thanks soooooo much, Melanie. You're the greatest. And thanks also to Nymeth, who was the coordinator for the holiday swap this year. I know she had a lot of helpers, and I want to thank them, too. Yep, I'd say you've been good this year. Nice haul! You have definitely be good and those drinks and chocolates will see you through all the Thursdays during the festive period. Enjoy! OMG, that is insanely exciting! 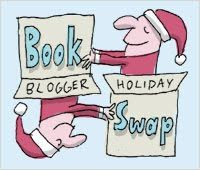 Well, you were a good blogger this year, so it is all worth it! You certainly made out like a bandit!!! All well deserved. Looks like you got a great gift! You must have been good this year! WOW! Congrats and what a great job, Melanie! Holy cow, you must have been extremely nice this year! Enjoy! I know for certain you have been very nice this year, so you are very deserving of all the lovely gifts! Wow, this sounds fun! I want in next year! Glad I found your blog! Wow, what lovely gifts you have! Dang! That's some spread! Enjoy. What a fabulous haul. You deserve it. Enjoy them. What a wonderfully thoughtful gift! Oh my! Look at all those wonderful goodies! Don't you just love being spoiled by Secret Santa? Oooh what wonderful goodies! Isn't it just too much fun to open your Secret Santa package! Enjoy! How fun! Good job, Secret Santa! I am glad you liked it! i had a really good time trying to figure out some things to send. Happy Christmas! What a thoughtful and generous gift! Wow!! That is so awesome Beth :D Looks like someone does indeed know you well :) Enjoy! Holy cow that was an extremely generous and thoughtful gift. You are definitely *not* on the naughty list this year for sure. The Girls is wonderful! I read it a couple of years back and loved it. I am so thrilled you got such a great gift - YAY!